Students are studying hard right now during their in-country training. We can’t wait to meet some of the bright minds that compose the PEACE THROUGH BUSINESS® class of 2019! The Women of Destiny Group in Rwanda and the PEACE THROUGH BUSINESS® Afghanistan Alumnae Council bring people together and support their communities. A network, an ecosystem, a team, a group, a collaboration, a sisterhood, a family. All of these words exhibit the love and support that PEACE THROUGH BUSINESS® exudes. Women around the world have pushed through opposition from all directions to pursue financial freedom, and it can be a lonely journey. Especially in countries like Afghanistan where women face threats for wanting to earn an education, or receive intense pushback from peers, neighbors and family for wanting to leave the house and pursue a career. Or in Rwanda, where women became the de facto leaders after a bloody genocide. The graduates of the PEACE THROUGH BUSINESS® program have taken this principle of networking and paying it forward to heart. In Rwanda, the PTB® class of 2017 grads formed the Women of Destiny networking and social group where they are pooling together what they’ve learned in order to give back and empower women who have not yet been given access to the education, training, and mentorship that they have received. The classmates support and love each other and their country, which was torn apart by genocide just 25 years ago. In Afghanistan, the PEACE THROUGH BUSINESS® Network provides a platform for Afghan businesswomen to collaborate, educate and mentor each other. The Network also founded the Bibi Khadija Awards to recognize and offer small grants to successful businesswomen and role models on an annual basis. Not to mention forming the historic Afghan Women’s Chamber of Commerce and Industry (AWCCI). Which communities are you a part of? Who are those like-minded folks that help you reach your fullest potential? When we ask ourselves these questions and take ACTION, then together we become what we want to see. Join our ecosystem of mentors, volunteers, donors, and friends. Our cornucopia of international business women – and men! – are ready to welcome you as a fellow supporter and together we will spread the love as we work toward a more peaceful globe by building economic security one woman at a time. 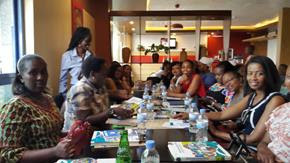 As students finish the fourth week of in-country training in Rwanda, let us consider the connections already being made and the unstoppable force that is created when women band together. Two students met during in-country orientation and discovered that they could work together in business. Anita Ahayo is in class with her business, St. Theresa Medical Clinic, which provides services such as medical check ups, dental, family planning, gynecology, and pediatric services. Anita met Rachel Kakize, who saw a lack of adequate medical equipment in Rwanda as an opportunity to contribute to the development of her country, and founded PrimaMed Technologies LTD. Her team of biomedical engineers, technicians and pharmacists supplies medical and laboratory equipment, consumables and reagents, and offers maintenance and after-sale services. This exchange is one example of PTB® students acting as a community. Benie Mukamurangwa is selling her cassava flour to her classmates, and Joan Matabaro is bringing her cakes for everyone to enjoy. Students are already setting an example of women empowering women, and we can all agree we need more of that in the world. *Above photo: Rwanda PTB® class of 2019 orientation at Magda Cafe. PEACE THROUGH BUSINESS® graduate Zainab Mohseni started school at the age of 7, but by 13 years old she was restricted in the classes she could attend due to the patriarchal standards of Afghanistan. Zainab is now the director and fifty percent owner of New Star Educational Society (NSES), which she opened in 2008. In its ten years of business, NSEN has helped over 2,000 students graduate from their intermediate-upper classes. Zainab’s graduation from the program and continual involvement in other activities secures her position in the PEACE THROUGH BUSINESS® Network (PTNB). READ MORE about Zainab’s journey as a woman in Afghanistan struggling to earn her education, to becoming a leader for women’s empowerment in her country. *Above photo: Zainab Mohseni was voted into the PTB® Afghanistan Alumnae Committee in December. Pictured here: Dr. Sharifa Hesarnaee, Zainab Mohseni, Masooma Abdullahi, Razia Arefi, Manizha Wafeq, Somaya Rezaie. An education can never be taken away from you. Starting and running a business takes a lot of nerve and grit. The backbone of PEACE THROUGH BUSINESS® in-country training is the curriculum, developed in partnership with our dedicated Presidential Sponsor, Northwood University. We thank NU for being an essential IEEW partner since the inception of PEACE THROUGH BUSINESS®. The suite of business tools conceived for our international program lends an edge to our women entrepreneurs looking to take their businesses to the next level and empower their communities. This last fall, NU worked with IEEW and our corporate partners to revamp the in-country training curriculum to meet the students’ needs as they have evolved over the past 12 years. 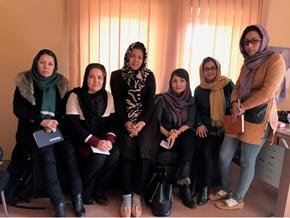 This is in addition to the new PTB® / NU Pathways 5-day mini-course that has allowed our team in Afghanistan to garner additional funding to educate women entrepreneurs in parts of the country with fewer opportunities. With a clearly articulated mission to develop the future leaders of a global, free-enterprise society, Northwood University is expanding its presence in national and international venues. Professors are engaged in economic and policy dialogue; students are emerging as champions in regional and national academic competitions. At all campuses and in all divisions, Northwood University is energized and is actively pursuing dynamic programming. The Northwood University mission is a perfect fit in IEEW’s pursuit to educate women economically, socially and politically. Here’s to many more years of empowering global women entrepreneurs together! 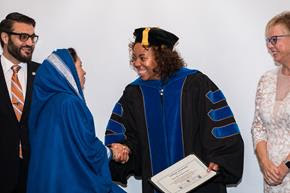 *Above photo: Dr. Tara Peters, Northwood University DeVos Graduate School, congratulates PTB® class of 2018’s Dr. Sharifa Hesarnaee, with her Certificate of Graduation at the Graduation Gala in Las Colinas, TX.